Can a UK Border Immigration Officer remove a stop indicator flag? Today at Belfast airport I was detained for about twenty minutes while the border officer left her terminal at the primary control point (PCP) and went to review my profile/files at the secure control point. Stop indicator. It's a simple yes/no flag and a code; no other information is available to the IO at the control point. They have to go to a secured control point to get the details. I have previously been refused a UK visa in 2015, and earlier this year I traveled to the UK as a non-visa national and was granted entry after a lengthy detention. My trip today was once again as a non-visa national without obtaining advance entry clearance. I was asked the standard what are you visiting for, how long are you staying, and then have you ever had any problem with UK immigration, after which she took my passport and issued me with a form IS 81, asked me to take a seat, and went off into their offices. After the officer returned, she apologized (there must be something in the water in Belfast) for holding me up and explained it was because of because of my entry clearance refusal back in 2015. Without request, she went on to say she would request the stop indicator be removed. There was no interview except the initial questions and they also did not ask for any documents. My question is does a border control officer have the authority to request a stop indicator to be removed, or was she just blowing hot air up my behind? My understanding from reading answers here has been that pretty much nothing can be done about a stop indicator for at least ten years. There is nothing that can be done about it and there is no way to purge it from their records. They are entitled to make a notation and if it has meaning for them, so be it. Just go about your business and deal with them in a stand up way and let them look up whatever they want. Write professionally, and explain your problem. They will then look into your case and remove that notification of your profile. It took them one month to respond but the case worker was very apologetic. One would think if an IO requested the traveler to do this to resolve the situation, then IO himself/herself cannot make such a request contrary to what my IO told me today. Worth noting though that this fellow had indefinite leave to remain (which I assume gives him more rights with UK immigration) while I am merely a visitor. Background. When a British Immigration Officer scans your passport the scanner retrieves basic information like nationality, passport number, name, and birth date. This is taken from the passport itself. The system then takes that information and queries an internal database to see if a "stop flag" has been raised. It's a simple 'yes/no' check mark on the IO's screen. If the flag is set, the IO has the option of going to a secured workstation and seeing all the details (this is what is happening when the IO asks you to wait and then disappears from the PCP for a few moments). The flag can be set lots of different ways such as an Interpol alert or tax issues (via HMRC) or criminal issues, but most commonly the person has had an "immigration problem" somewhere in their history. Invariably the inspection process is delayed and this can cause the person to become embarrassed or upset, especially if the person thinks the stop flag has been wrongly set. End of background. My question is does a border control officer have the authority to request a stop indicator to be removed, or she was just blowing hot air up my behind? An IO will not (and can not) remove the flag by themselves; instead they can add something to your transcript which will be picked up by the 'back office' where a bureaucratic process is triggered. As far as "blowing hot air" goes, yes, an IO will say just about anything to make the inspection process go smoothly and of particular interest, they like to make everything sound very easy. Based on what you wrote, they have handed you back your passport and reset the login to the secured workstation, so what 'exactly' are they going to use to clear the flag? Did you write down their name? How are you going to chase it? So it's fine ask to the IO (in a civil tone) when and how she is going to make the amendment and what information she needs from you in order to carry this out. If they respond with some fluff you can adjust your expectations downward accordingly. One would think if an IO requested the traveler to do this to resolve the situation, then IO himself/herself cannot make such a request contrary to what my IO told me today. An IO can also make it sound real easy by giving you an email address and telling you to write to the Home Office directly. This is certainly a valid approach and one I would endorse because it's something that leaves a paper trail and hence can be chased. Bear in mind that while writing to them has some advantages, they may or may not honour your request (most likely they will not). Worth noting though that this fellow had indefinite leave to remain (which I assume gives him more rights with UK immigration) while I am merely a visitor. It's not so much that the person had ILR, but more to the point: the person applied for and successfully obtained a visa (ILR). Overall I suggest avoiding internet lore because there are many variants and nuances to each case that are not revealed by the people who write about their experiences. See also the "FOAF Syndrome" in which visa problems are legion. For you, the ultimate remedy is to apply for and receive an entry clearance. In the application you can explain that you do not need an entry clearance, but want to apply for one anyway so as to clear up the delays and distress caused by having a stop flag raised every time you enter the UK. Normally they will clear the flag if the person applies successfully. If they do not, you would then have solid grounds for a complaint. An entry clearance acts as a panacea to almost all the problems one can have with UKVI and clearing up a stop flag is no exception. After being stopped a couple more times within the span of one year by UK immigration while visiting, I decided to lodge a formal complaint through the Home Office however I did not get my hopes up. 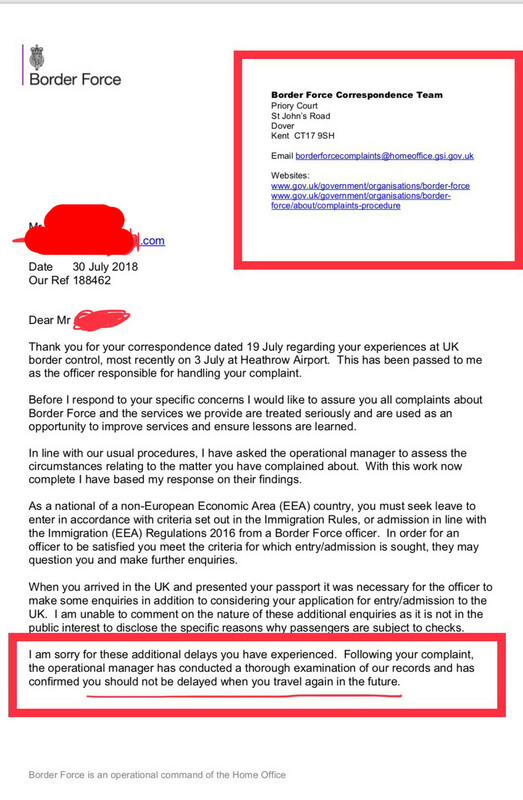 After two weeks, today I got a reply back from the UK Border Force apologizing for their admittedly unnecessary stops and notice that it will not happen again. You can use the online forms on their website like I did, or borderforcecomplaints@homeoffice.gov.uk or complaints@homeoffice.gov.uk to contact them. They do respond quite promptly. Apparently this does work because user Forlorn Lancer was able to get his flag removed after following same procedure. I just entered the UK for the first time today after my complaint. I spent the standard one minute on my landing interview at immigration control like most other travellers, confirming that the flag on my profile has indeed been removed. Not the answer you're looking for? Browse other questions tagged uk customs-and-immigration visa-free-entry or ask your own question. UK Border control always takes me under investigation. Why it could be? Border officers wrote EMBARKED in my passport. What does it mean? Will I be denied entry again? Can applying for US Global Entry reduce the frequency with which I am stopped at border control? Is an entry to Mexico a red flag in U.S. immigration? US wife visiting me in the UK - what to tell the immigration officer? What does this pen notation in my UK entry stamp mean? How can I know if I am still refused entry to the UK? Are visa-free visitors to Ireland less likely to be denied entry when compared to the UK? Why did a Dublin immigration officer write “IT NI” on my passport stamp? How do I stop a CBSA officer from wasting my time, by falsely alleging that some of my items weren't bought in Canada?